Should You Discuss Religious Practices During a Job Interview? The interview question was seemingly simple, “How do you relieve stress?” And as Michael sat looking at his two interviewers awaiting his response, a myriad of things went through his head. “How do you overcome stressful situations?” one of his interviewers added to the originally posed question. At that point Michael began to get nervous 1) because he felt like he was taking too long to answer and 2) because although he knew there were “appropriate responses” he could offer, they would not be true. Michael could say he exercises, uses stress relief toys, or even listens to calming music. And while all of those things are helpful, they are not Michael’s no.1 approach to relieving stress. His approach fell under a “touchy subject” when it came to job interviews and workplace etiquette in general, and he wasn’t sure how the interviewers would perceive him if he expressed this aspect of himself. Yet, priding himself on integrity, Michael decided to tell the truth. Both Michael and the above scenario are real (different name, of course) and when I heard about his experience during an important job interview, it led me to think about how stressful answering interview questions can be. Every job seeker wants to say the “right” things so that he/she is viewed favorably by the interviewer(s); so, there are certain do’s and don’ts when it comes to how to answer interview questions and/or what topics to avoid during an interview—and religion is usually high up on the list. Unless you are interviewing for a position in a political or religious environment, you need to avoid both of these topics. If the interviewer starts discussing his or her own opinions or beliefs, be polite and listen, but don’t interject your own views. Instead, be prepared with a question directly relating to the job. You may wonder if the topic of religion or one’s religious affiliation/beliefs would even need to be addressed in an interview. Well, TriNet referenced a Gallup poll revealing that 90 percent of American adults say that religion is either very important or fairly important in their lives. 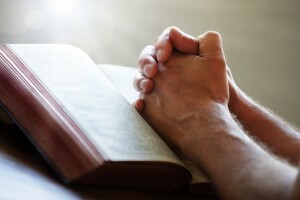 Although there are mixed views on religion’s influence on American society, many people still do identify with one or more religions, even if practiced moderately. And in many cases a person’s religion will affect his or her daily lifestyle. So, like in the case of Michael, religion can weave its way into one’s professional life or practices, even if subtly or in a seemingly insignificant way as helping to relieve stress. And if your religious practices do indeed affect your professional life—whether those are the source of your career motivation, career outlook, or how you handle conflict—should you then divulge this at times controversial information during a job interview? Similar to discussing a pregnancy or political views and affiliations, people tend to shy away from bringing up their religious preferences and or practices (in relation to their careers) during interviews because they fear discrimination. It sounds good on paper, of course, but like ageism, sexism and discrimination against those with disabilities, the LGBT community or racial discrimination, many job seekers are aware that company’s do in fact break discrimination laws when hiring, and oftentimes it’s extremely difficult for a job seeker to prove he/she was discriminated against, especially if the company doesn’t have a history of complaints. Michael made a personal decision to make his religious practices known (to an extent) and whether or not that will affect his future employment remains to be seen. But, as recruiters and HR personnel, do you believe it is up to a candidate to decide whether or not he/she will discuss any religious practices during a job interview, or like most interview etiquette advice out there, should candidates simply avoid this subject matter?